I had planned to meet a friend for lunch today and as she is another keen photographer I asked if she would like to have a look around some of the HIP exhibitions before we ate. We began by looking at The Kings of England by HIP Artistic Director Graeme Oxby in HIP Gallery 4. It is a collection of bright photos of Elvis Presley impersonators, fans and memorabilia. Photos are presented in large, gold, ornate picture frames against grey walls which I think works really well and adds to a sense of opulence around the king. There were several different styles of photography mixed up in the same display. There were some ‘live’ photos of Elvis impersonators on stage or captured naturally, but there were also some staged or posed photos, some of which were heavily edited and then there were a few cultural photos of fans in their home or of their accessories. While the variety made it interesting I felt that if it had been laid out with the different style of photography together it would have told more of a story as you walked around the room. I also thought that the ‘cut out’ photographs were a bit out of place and could have done with not being included. The addition of a ‘throne’ in the gallery made it quite fun and gave it an interactive feel. When I was in there a group of children were taking turns to take photos of each other sitting on the chair. Also in the same gallery was Lumen by Verity Harr whose photographs investigate the way light can transform the ordinary into something sublime. Although very different from The Kings of England I thought the two displays worked quite well together. They were separated clearly enough that they didn’t distract from one another. In the POP Gallery there was a display called The British Abroad by Peter Dench. I thought it was laid out well and told a clear story although it wasn’t clear which end was the start and twice when I visited it, I found myself viewing it backwards. There were quite a lot of images in the display and all the photographs were displayed at the same size, in simple frames, on white walls. I found the photographs themselves quite difficult to look at, they were very embarrassing and made me very uncomfortable about being British. 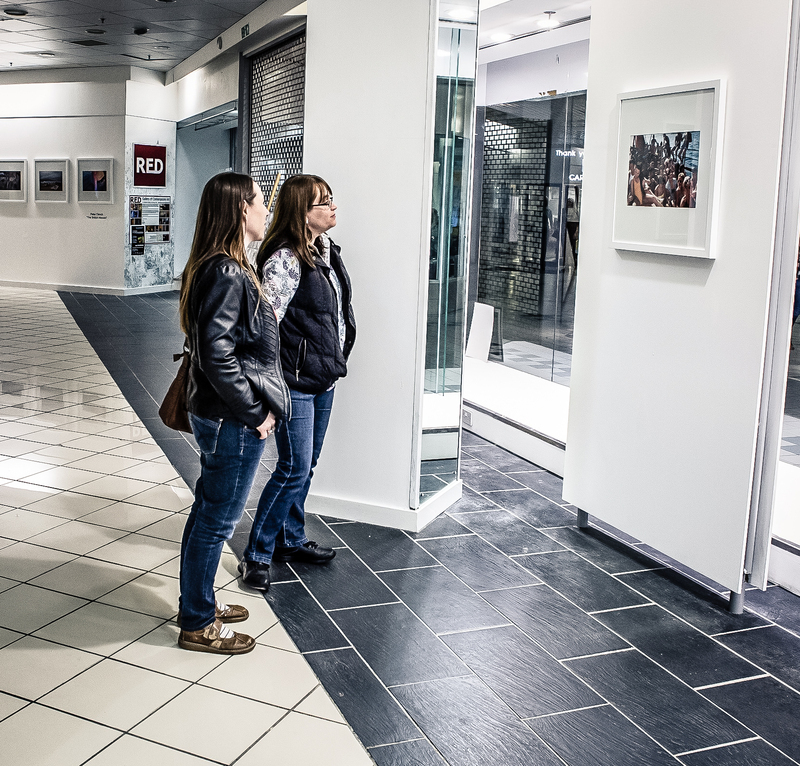 The Royal Photographic Society’s Biennial Exhibition was displayed in the POP Gallery 2. I really enjoyed looking around this exhibition. It was packed with all kinds of photography, some that I liked, some that I didn’t and some that I thought was outstanding. Photos here were taken by 100 different people, but all were displayed at the same size, in the same frames and at the same height. In the centre of the room each photograph was displayed on its own wall and those along the edges of the gallery were displayed with enough space around them to not distract from each other. Compared to our little end of year exhibition last summer, both galleries felt much more professional and much more ordered and coherent. We had to display our photographs around butterflies, mirrors and canvas prints. We displayed our photographs in a cafe that had green walls around tables and chairs where customers would be having lunch and drinking coffee. Our photographs were not necessarily the main purpose for a lot of the visitors. Also because each of us planned to display a different number of photographs at different sizes the display was less co-ordinated than perhaps it could have been. We had issues about how we could fix our photographs to the walls of the cafe. We were not allowed to drill holes and ended up printing onto foam board and fixing them with velcro. This was not ideal as it pulled the paint from the walls after and the room needed decorating anyway. From our point of view it meant that we couldn’t display our photos in frames as we had initially hoped. Having looked around the HIP exhibitions I have a clearer idea of how I would like to see my photographs displayed in the future.